When I came across this recipe, I could almost taste the lemon flavor of the icing on my tongue, and decided to save the recipe and to make these cookies. As you already know, I only post recipes which I have personally tested, and share my own pictures of the finished product (I’m still a newbie on food photography..). I also post some products completed by others in their kitchens, but once I had the pleasure of sampling them, I am more than honored to include them in my post, with the permission of the chef, of course. These Frosted Lemon Cookies are actually very good, and the lemon icing is a very refreshing change for your taste buds, after sampling a myriad of sweets during the Holiday Season. 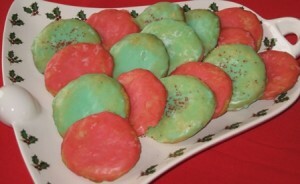 As this recipe is for drop cookies, it is a quick project and even the frosting is quite simple. The only thing that requires a little more patience is the drying time of the frosted cookies, but even that is possible during the same time frame as the baking. This recipe yields 5 dozen cookies. Few drops of your favorite food coloring (I split the frosting in half and used two different colors for each batch. One was red and the other one was green). Combine the butter, sugar and eggs. Mix well, until well blended and creamy. Add the lemon peel and lemon juice, and mix well. Mix the flour with the cream of tartar, salt, and baking soda. Gradually add to butter mixture and continue mixing until a smooth batter is formed. Drop cookie batter by rounded teaspoonfuls at least 1-2 inches apart, onto ungreased cookie sheet. Bake cookies for 6 minutes, or until edges appear golden brown. Remove and cool enough to handle, as you will frost warm cookies, and let them on cookie drying rack, until the frosting is set (firm to touch, not soft or sticky). Add more sugar if you feel the glaze is too thin, due to the amount of food coloring you added. These cookies also taste really good without the icing. Frosted cookies need to be stored in an airtight container to prevent from drying out. To make sure you have the correct icing consistency, do not add the food coloring until after you mix the sugar and lemon juice, and see how thick it should be. After you add the food coloring, add more powdered sugar to get the same consistency as it was before. If your icing is to thin, it will take much longer to set. Those look so good. I think I will try them for Christmas and Thanksgiving. I received lots of compliments on these cookies. They are really yummy.